Welcome! Forty feet underground , images carved and painted in the sandstone walls and pillars. This is your chance to tour this claim which has been worked since the early days of opal mining in The Ridge. Chambers of the Black Hand has the only opal shop underground. 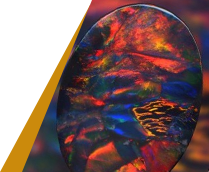 As opal is Australia's national gemstone, don't miss out on this great experience. Our map location in Lightning Ridge, NSW is on the 3 Mile Road, 5klms up opposite yellow car door 7. Expect to see.. Native animals, Lord of the Rings characters, biblical entities and dinosaurs like you have never seen them before. Carved on the wall of an opal cave, these captivating images have been created by local opal miner Ron Canlin. 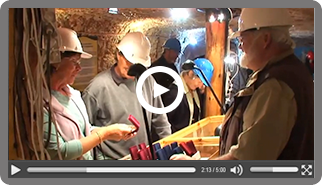 Ron has transformed a number of drives (tunnels) of an old opal mine into an interactive work of art. Countless carvings are set in sandstone on the walls. It has taken the miner 18 years to complete the carvings so far and the evolving process will see even more sculptures and chambers added to the tour. The mine was converted into a privately managed tourist attraction which offers guided tours, interactive display and underground shop. Chambers of the Black Hand is a local business managed by local people showcasing the best Lighting Ridge has to offer. Ron served with Royal Marines S.B.S. – 5 years on oil rigs as a diver. Ron is married with one daughter and 3 granddaughters . Ron and his wife Glennis came to Australia in 1980, making their home in Southport Queensland. Having always been interested in “fossicking”. Chambers of the Black Hand is run by Trevor and Cheryl Hudson. Local miners themselves for some 25 years, they have endured the hardship and exhilaration that comes with chasing the ever elusive black opal. We came to Lightning Ridge approx 25 years ago for a week end and we are still here.